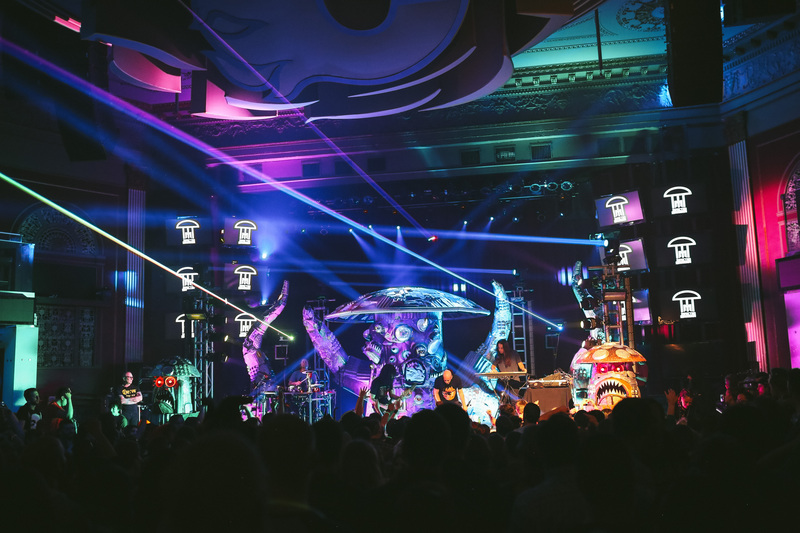 Once again Blueprint Alberta delivered a truly world class event by bringing us the legendary Infected Mushroom and their new Animatronica Tour to Flames Central back on Friday May 8th 2015. This highly anticipated tour came on the heels of the infamous and visually pleasing Fungus Amongus Tour which went around the globe a couple of times. 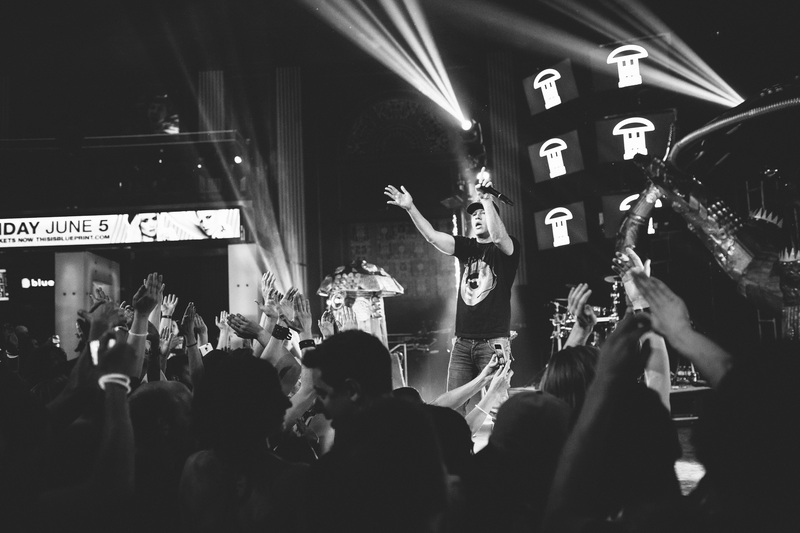 It was a big switch in stages that has also inspired Infected Mushroom to release a new album coming in the Fall of 2015. I’ve been following Infected Mushroom since the late nineties so needless to say I was very much looking forward to this interview and show. I had the opportunity to see the Fungus Amongus Tour back in 2012 at WEMF in Ontario and let me tell you that my mind was blown by the pod show and I was curious to see if the new stage design could measure up and let me tell you it did in a massive way! AU5 from one of my favorite labels Monstercat and Infected Mushroom’s Tour Manager Randy Seidman warmed the night up for the guys with solid DJ sets. There were some local Blueprint AB residents on the bill as well but I didn’t have the chance to catch those guys as I arrived late. Sorry guys! There was a short intermission after AU5’s set and you could feel the anticipation building as the music was getting louder and the light show and machine-like stage started to move in motion to the beat behind the huge black veil. When the veil dropped Infected Mushroom exploded onto the stage with their rendition of Rage Against the Machine’s “Killing in the Name Of” and from there it was sheer mayhem! 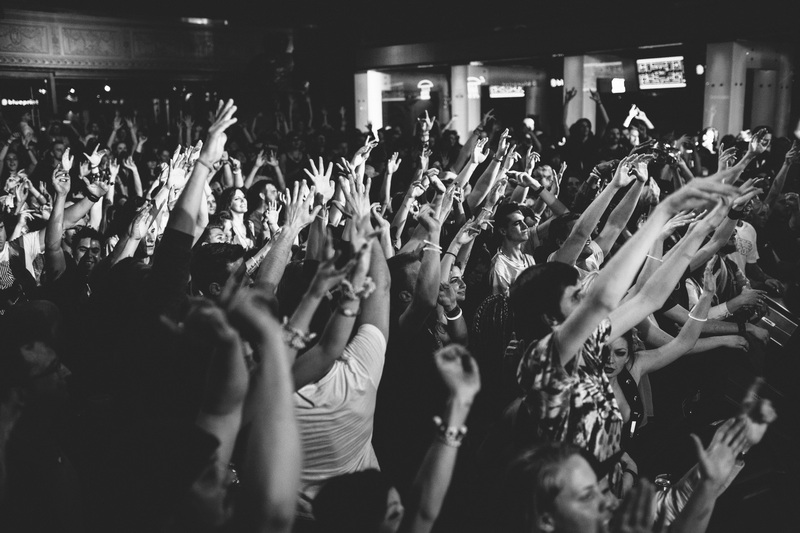 The crowd spanned years in age from eighteen year old ravers to the old school psy-trance fans from years gone by, all here for Infected Mushroom. 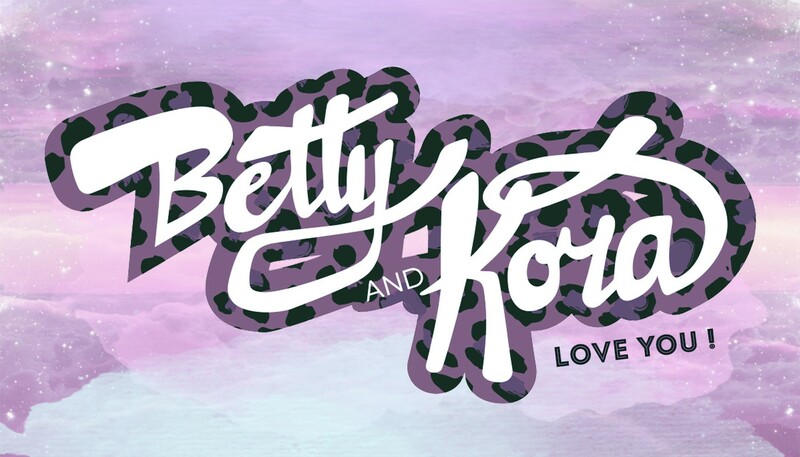 Betty & Kora: You’ve been creating music magic and performing live since the 90’s. We want to know how you have evolved in an ever changing music scene and what has kept you inspired to stick with your style and genre, psychedelic trance, in these EDM driven times? Amit: Well first of all the most important thing and what has inspired us is we have to remember to enjoy ourselves. We started producing and playing psychedelic trance from the start. We love the life of the road and the life in the studio and we just love electronic music. We absorb and embrace all the young producers and all styles of music and take it for our own because we’ve been at this game for a long time. B&K: Tell us where the Animatronica tour idea came from and what inspired the switch from the highly acclaimed Fungus Amongus tour that went around the globe a couple of times? Amit: Fungus Amongus was an amazing tour but we felt that a lot of artists are doing visual shows, from Deadmau5 to Pretty Lights to Excision. Even though they were different shows we felt everybody is doing the same thing. So we wanted to do something different. We’ve been going to Burning Man for many years so we decided to bring that vibe of the robotic Burning Man design and change it up and bring this set up to the clubs and big stages around the globe. B&K: You’ve worked with numerous musicians over the years notably rock legends Ray Manzarek (The Doors), Perry Farrell (Jane’s Addiction) and even Jonathan Davis (Korn). How did these relationships come to fruition and what prompted the genre bending? Amit: You know me and Erez were big heavy metal fans and when we moved to L.A it was kind of our thing. Through our manager back in the day we met Jonathan Davis. Perry Farrell was a fan of Infected Mushroom and he came to our shows and he was retarded for our music. The Doors we had the opportunity to meet Ray Manzarek and work with him in L.A. We even brought him to Israel on tour. B&K: You’ve added live music elements such as a drummer and electric guitarist to the new tour, and you have previously used live music elements in older tours. Tell us about the musicians who are on this tour now and how does one get selected to become a part of this iconic group? Amit: What’s cool about these two guys is that these guys have been with us since the beginning. They are the original drummer and guitarist that started with us in L.A. back in the day. Someone would have to die and we’ve been friends for years. You just don’t join Infected Mushroom. This is original crew and family. If someone dies we’ll let you know. Haha! B&K: With the birth of this new stage design and tour, what are the hopes we’re going to see a new album come out of this newly found inspiration? Erez: The album is ready and it’s really, really good and we’re looking to release it in September. Erez- Indeed it did. This stage is completely Burning Man driven. It’s designed by the same guys that designed the Octopus at Burning Man. B&K: What shows or festivals are you two most excited to play this year? Amit: We’re excited to be playing Sziget Festival in Budapest, Hungary, Solidays Festival in Paris, France and we’re looking forward to touching down on new ground and playing festivals we’ve never played before. 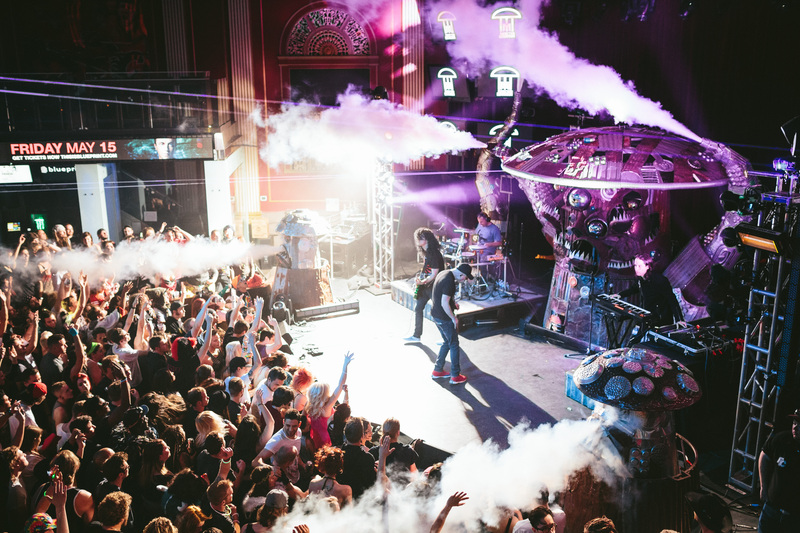 B&K: Infected Mushroom has been an electronic music legacy but where do you go from here after you’ve already accomplished so much? What do you have planned for the future? Amit & Erez: We just want to keep getting better and better, keep our show fresh and remember to always have fun. I want to thank Amit and Erez for hanging out with me and giving me the opportunity to do this interview. It was a pure pleasure and it was really amazing to meet these guys as I’ve been following them since the late 90’s. I’d also like to thank the Blueprint Alberta crew for always taking of my crew and I at every show.